Contactually is a CRM tool designed for real estate professionals. Its features include lead segmentation, automated workflows, sales performance insights, mobile apps, and more. In this article, we cover user reviews and pricing. Ready to try Contactually? Get a free trial. Users who gave Contactually a positive review said that the software has efficient tools for organizing contacts. Excellent customer support was also cited. Users who gave Contactually a negative review complained about frequent disconnections from integrated third-party apps. A few of them also noted that the pricing is a bit steep for small businesses. Contactually has three subscription options. When billed monthly, the Professional plan costs $69, the Accelerator plan costs $119, and the Concierge plan costs $599. The main differences between the plans are the availability of some features such as lead source integrations, bulk messaging, and more. Ready to try Contactually? Get a free trial. 6 Best CRM for Small Business 2018 — CRM software helps your sales team stay organized so they can better focus their efforts and close more deals. In this guide, we compared the best CRM software in terms of deal and opportunity management, workflow automation, price, and other considerations. Can Contactually help increase the leads’ email response rate? Yes. Contactually users can use the Best Time to Email feature to see suggestions for scheduling emails. These suggestions are based on the usual times that each contact responds to emails. How does Contactually help its users keep track of lead pipelines? Contactually sends reminders to connect with leads that are vital to a team’s business growth. The software also enables users to go back and review their lead conversations done via emails, texts, and phones. Not sure if Contactually is the right fit for you? Read our reviews of all top CRM software providers. Contactually is a very user-friendly CRM. It’s easy to input contact information, a nice way to record touch-points, and also has a way to automate some processes within your business, like recruiting. The reps reach out to you to make sure you’re catching on to how to use their software. I even had a personal webinar with a rep and a teammate to go over specifically how to work their software into our business processes. There really isn’t anything that I can think of that Contactually doesn’t do well. If I had to pick something, I’d say the pricing structure could be a little more affordable-but that certainly doesn’t weight that much on my opinion. I wish I would have just known about this program sooner! Since for one of my clients, we are knee-deep in using a competitor program and the thought of transferring everything over scares me! It is much more user-friendly and has more features than what we are currently using. Contactually is an amazing take on the CRM. It does a lot of what normal CRMs do but the added element of tracking frequency of contact, and making it easy to make sure you stay in touch with people on regular cadences, is so incredible. It helps you avoid those “oh I should reach out to XYZ” moments that you have far too late. The pricing is a bit high if you are focussed mainly on its contact cadence features, and aren’t making use of templates/programs/pipelines/etc. Those are powerful features for sure, but if you’re using it mainly as a personal CRM/reminder tool, you likely won’t use them, and will pay a lot out of pocket for features you don’t need. To really get the most out of it, you need to be able to devote at least 30 minutes a day, and a lot more at the start (to bucket/group your contacts, which is pretty much required to get the most benefit from the product). If you don’t make that commitment, contact reminders start to pile up and you can start to get bogged down. The bucket game is by far my favorite feature. The ability to easily (and in a gamified way) apply people to buckets or lists is amazing. It helped me get going fast, because who wants to spend hours manually adding tags to each contact? Contactually also helps me stay in touch with my contacts, based on the list (or bucket) they belong to. I love their suggested merge features as well as it helped me clean up my list and finally being able to track when I use my own email to contact someone is exceptional. Overall, I’m very pleased with Contactually. Maybe a lower plan for smaller businesses would be a good thing to have but it’s still affordable as is. How easy it was to start using now. Their learning curve is not steep at all. I wish I’d known about them sooner. 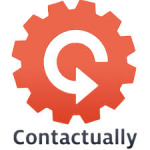 Contactually collects all emails sent to and from contacts. Also, Contactually captures phone calls and their time and duration—obviously not the content of the phone calls. It is hard to understand some of the more advanced features, such as mass mailings. I also find that several times a year the link from my Outlook Exchange email accounts and Contactually is dropped and I have to manually restart the link and synchronization of my emails to my clients. I wish I had known about Contactually before I tried other programs such as Pipedrive. The answers to questions can be long-winded, it depends on the help-desk person. If I don’t get the help I need, I’ll send an email in and it always gets answered. This is big! Be sure to use the email address/account you plan on using after the trial. I used a personal Gmail account, assuming all the workflows would transfer over and it did not! Lot of extra work.